Your Next Stamp After Party! Hello! So how do you like all of the new Your Next Stamp Dies and Stamps? Aren't they so much FUN! We are celebrating the new release with an after-party today:) Make sure you head over to Karen's Blog to see more amazing projects from the DT using the new products! For my card today I used the adorable new Smiley Happy Critter Crew Set Three along with the fabulous new YNS Whatnots Die Set-Easter Goodies! I also used the Flower Fun Spring Grass Die:) I just think these all look so cute together! 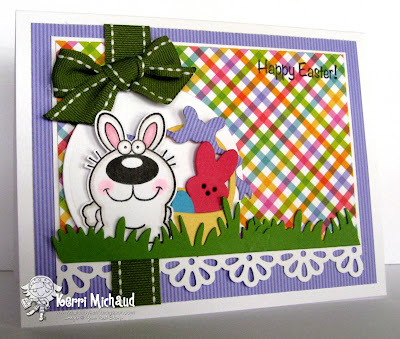 The dp I used is Doodlebug Design Fruit Stand and the sentiment comes from the Bunny Ellie Stamp Set.